collocate them in a hosting facility. Instead, you may chose the initial capacity for your PortaSwitch in a cloud that you need for your project, and we will provide you with a ready-to-use B/OSS and switching system running in a cloud in just a day. With a cloud-based PortaSwitch you can launch your project quicker and accelerate the return on your efforts. Even when your business needs change as your project expands, you can scale up your PortaSwitch installation in a cloud at once without any additional capex. Service usage subscription fees that are based on maximal number of concurrent calls and the amount of billable events (xDRs) processed by PortaSwitch on a monthly basis. Instantaneously set up a staging system to verify new maintenance releases before the updates of main production system, run interoperability tests with the third-party equipment and applications internally, and conduct the trainings for resellers and distributors. 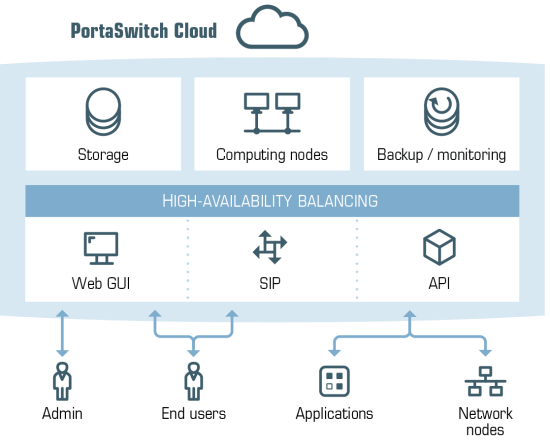 With PortaSwitch in a cloud, carriers, telecom operators, and service providers can gain an unparalleled level of flexibility in managing their cloud switching and B/OSS systems. Modest implementation budget enables businesses of all sizes to become active players at the telecommunications market in no time.